Additional Info: Blu-ray/DVD player, large gated veranda with fitted 6/8 seater picnic table and parasol. Charcoal barbecue in the outside storage box. Check the chart below for price and availability,it is always kept up to date. Select from the available holiday dates below, note the price and contact us for any further details. We always keep the availability and pricing chart fully up to date. Please note; All prices shown are INCLUSIVE OF FRESH BED LINEN & UP TO 8 ENTERTAINMENT PASSES. 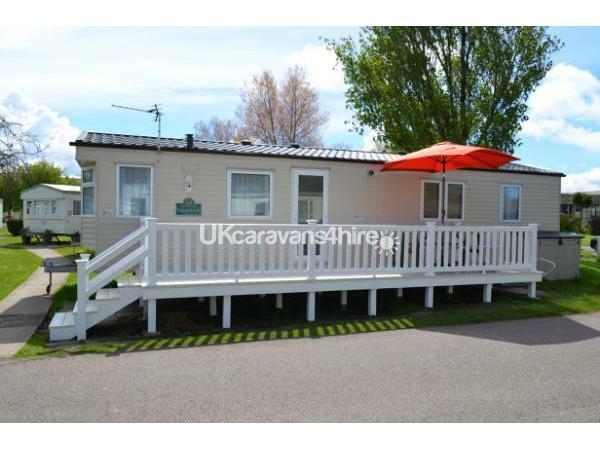 This Willerby Solstice holiday caravan is our second caravan on the popular Lakeside Caravan Park within the Butlins resort at Minehead, Somerset. 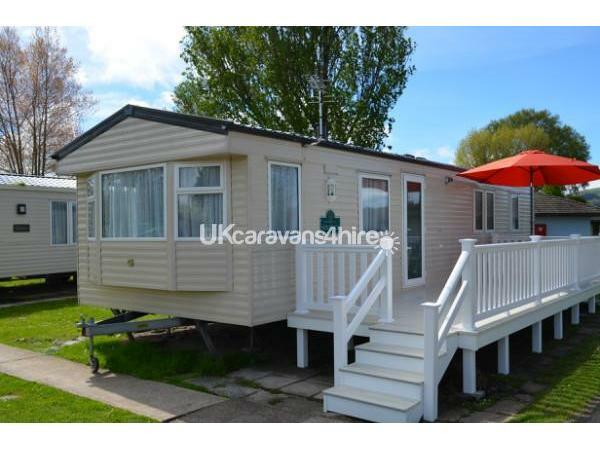 It is sited close to our existing caravan and within 5 to 10 minutes stroll of the main Butlins leisure and entertainment facilities. Comfortably large enough for 6 people and able to accommodate 8, the accommodation consists of a double bedroom, 2 x twin bedrooms,(the beds can be pushed together to make a double), toilet with wash basin, shower with wash basin and a spacious living/ kitchen area with another pull out double bed if required. Don't forget; from March 2015 all your bed linen will be provided and your beds will be made when you arrive. There is a reserved parking space within a few feet of the door, right next to the large veranda which includes an all weather picnic table and benches complete with parasol for those warm, relaxing, summer evenings. 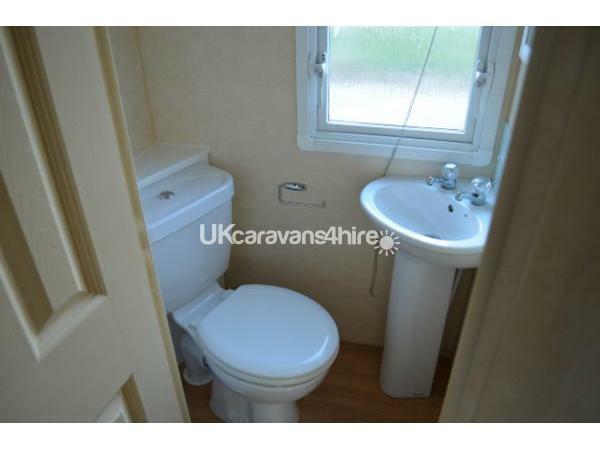 This caravan has had a major re fit prior to the start of the 2015 season. Striking new modern upholstery covers re padded seating. The chintzy curtains, nets and pelmets have been replaced with light and airy venetian blinds and plain matching fabric pelmet, all this is set off by new carpet in the lounge/dining area. Other areas have not escaped our attention; new mattresses have been fitted on all 4 twin beds and the put you up bed in the lounge to complement the new one on the double bed last year. 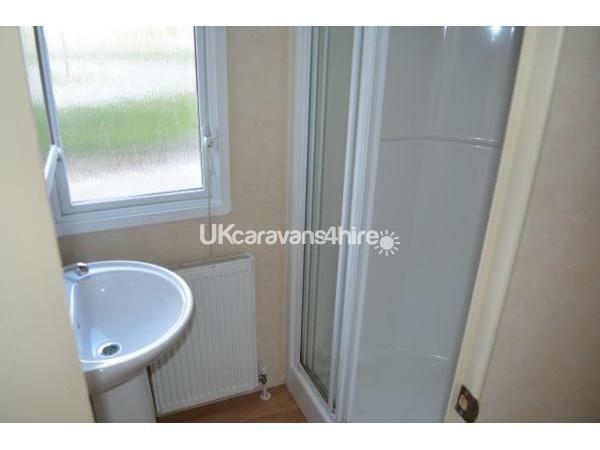 A new, more spacious double cabinet adornes the bathroom while, unusually for a caravan, the new cooker hood extracts all the cooking smells to outside. All this and central heating, double glazing, a full size cooker and fridge freezer, 32" LED TV with Blu-ray/DVD player, iron & ironing board, hair dryer and a full array of good quality crockery, cutlery and kitchen equipment. All you should need for a pleasant and relaxing holiday, the only thing we can't influence is the weather. Our guests are free to enjoy all of the Butlins facilities available to their own guests at no extra charge. (Except on some special feature week ends). There are a host of local attractions including a golf course next to the resort, fishing on the lake, and the medieval village of Dunster, with its imposing castle. The splendor of Exmoor only a short drive further along the A39 and the area boasts some fine local hostelries and restaurants.